In this race of acquiring more cash-paying patients, those physical therapy players (or, service providers) who are moving forward with a well-planned, consistently-executed, and well-managed marketing campaign are winning. 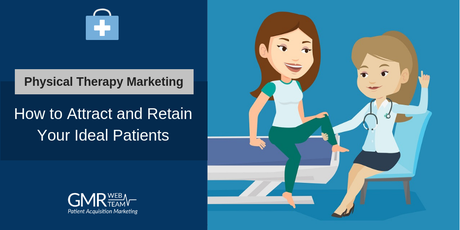 In this post, we’ll learn how physical therapists, occupational therapists, and physiatrists can effectively market their practice using online marketing channels so they can consistently attract and retain their ideal patient mix. Before that, let’s first understand why exactly physical therapists need digital marketing. Over 3.5 billion searches happen on Google daily. 1 in every 20 searches is related to healthcare including searches for rehab and physical therapy. Not just on Google, patients searching for physical therapy information or services online also tend to look through multiple online channels such as social media, review sites, and other informational websites. 77% of healthcare inquiries begin on search engines. 72% of patients use online reviews as their first step in finding a doctor. 80% of all social media users in the US are specifically looking for health information, and nearly half are searching for information about a specific doctor or health professional. As most of your prospective patients are looking for you online, you need to have a strong online presence. However, identifying and targeting your patient mix isn’t as easy as it may seem initially. Physical therapy as a highly-competitive business landscape is witnessing continuous mergers, acquisitions and “roll-ups“ that are increasing competition for physical therapists trying to capture high-paying cases. That’s why online marketing is crucial for the success of physical therapy practices. Now, let’s learn about the different physical therapy online marketing solutions and the problems that they will solve. When executed correctly, online marketing can help you acquire more new patients on a consistent basis. Digital marketing allows for specific, direct communication with your target audience of patients by segmenting them based on their age, gender, location, marital status, and even annual income. That’s called demographic targeting. With organic search engine optimization (SEO) methods, you can reach out to your preferred patient demographics. This is possible by analyzing the demographic data by researching the keywords used by patients when searching for a provider. While in paid methods, the demographic targeting gets even more specific and direct. Tools like Google Ads and Facebook Ads Manager let you run online ads separately for particular segments of patient audience defined by their demographic data. To make your demographic targeting even more effective, you can go with many other targeting options other than demographics, like the time of day, geographic location, etc. An effective way of driving patient referrals is by spreading positive word-of-mouth. With online channels like social media sites and review sites increasingly becoming a popular source of information for patients these days, you can utilize them to spread your happy patients’ praises and remarks in a highly targeted fashion. For example, you can follow popular hashtags that patients are using on Twitter and become active on them, like responding to popular patient queries (response rate helps with expanding the reach) and creating relevant posts that will be useful for patients. Symplur is a helpful site to identify industry-specific hashtags for your specialty. You can find popular hashtags based on the top 10 tweets and influencers. You can also learn about the tweet activity for a recent period which will help you better determine the hashtags you want to follow. Another way to boost patient referrals is improving your online reputation and authority. Patients value online reviews as much as doctor recommendations. You can gather as many positive reviews from your happy patients as you can and showcase them to your prospective patients to influence their decision making in your favor. We’ll cover reviews later since they are a part of the online reputation management topic. For physical therapists, getting professional referrals is as essential as acquiring patients directly. After all, referrals result in more business, and that’s what you’d always want. Referral marketing solutions for physical therapists aim at building lasting relationships within the medical community by positioning yourself as an expert and demonstrating your value. Referral network building strategies are essential as studies suggest that a substantial portion (43%) of referrals are made to providers that a referring physician does not know well. This may be the cause behind many of those referred patients never following-up with the referring physician. Make a list of providers in your vicinity and visit a few of them every week on a rotating basis. Bring along a friendly smile and perhaps some goodies. Keep your contact information (on your business cards, your website, and social media pages) up-to-date. Publish thought-leadership blogs and reports within your medical space as this will help you in positioning yourself as an expert in the field. Send professionally designed newsletters and emails communicating why providers should refer to your practice. Quality treatment of patients comes first, but never forget the role of the front office staff when it comes to patient experience. Your patients expect friendly, communicative, and attentive interactions before and after they undergo treatment. Overall positive experiences help create long-term relationships with your patients. Having said that, you want to make sure you have a system in place to monitor patient experience. This system should also help you understand the sentiments of your patients. A valuable tool that helps you gauge patient sentiment is RepuGen, a patient experience monitoring platform. Its sentiment analysis technology can help you learn about your patients’ feelings and emotions (at large) about your staff members, providers, and the practice as a whole. It works by privately collecting feedback from your patients and analyzing the gathered data. Additionally, RepuGen collects the Net Promoter Score (NPS) from your patients to help you measure patient loyalty by asking your patients a simple question: On a scale of 0 to 10 (with 10 being most likely and 0 being not at all likely), how likely are you to recommend our practice to a friend or family member? When implemented correctly, NPS tracking will give you access to a wealth of actionable data that physical therapy professionals like you can use to improve patient retention, and to enhance outcomes. As we’ve already learned, patients value online reviews as much as doctor recommendations. In those circumstances, you should have a proper process in place to monitor how your patients are reviewing your services online. After all, even a few negative reviews from your patients can drastically affect the growth of your practice. To tackle the menace of negative reviews, you should focus your strategy on generating a lot of positive reviews from your happy patients. When prospective patients will find that most of your existing patients have reviewed you positively, they will give lesser attention to the negative remarks by a few of your unhappy patients. A HIPAA-compliant online reputation management tool can help your patients leave reviews, instantly and hassle-free. Be assured that most of your patients will be leaving positive remarks (if you’re providing an excellent service of course). That way, your online reviews will present an accurate picture of patient satisfaction. This tool will also help you in expediting service recovery by prompting you about an unhappy patient leaving a negative review. You will then have the opportunity to contact that patient to try and resolve his or her issue. Physical therapists have a real challenge ahead concerning their growing market share. At GMR Web Team, we help physical therapists improve their market standing and drive higher patient volume with our physical therapy online marketing solutions.